We decide to go to Switzerland to see Tim’s nephew, Josh. His band, The JW Jones Band, is on tour in Switzerland and his last gig is in Sierre, about 400 km from where we are staying. 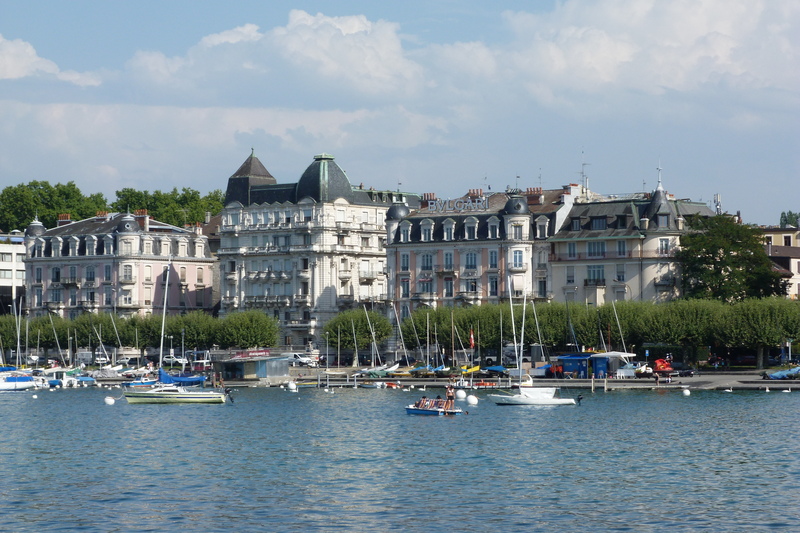 Since we’ll have to go through Geneva, we decide to spend a night there, followed by a night in the countryside with a student of Tim’s, and then go onto Sierre. We travel by train from Digoin to Lyon to Geneva. 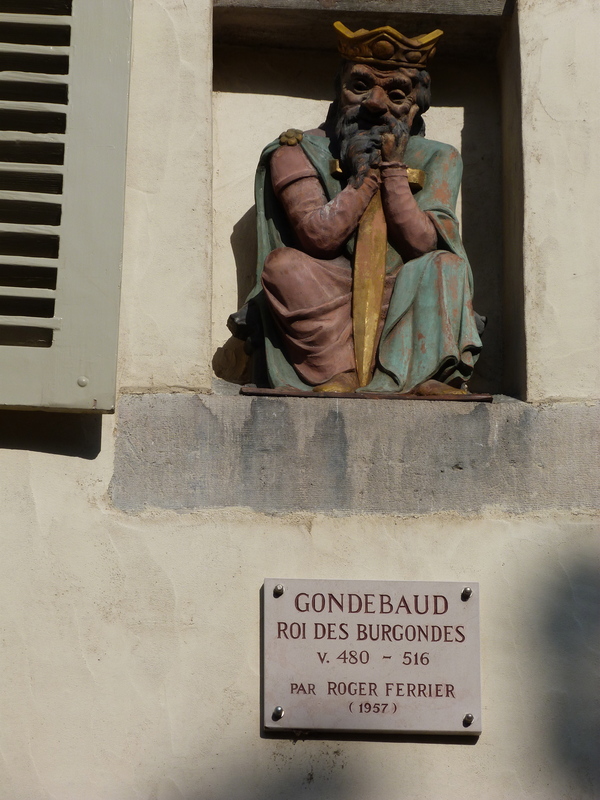 The Rough Guide tells me that Geneva is the most expensive city in Europe, which is confirmed the minute I try and find a B & B. I book us into a hostel that is close to the train station. 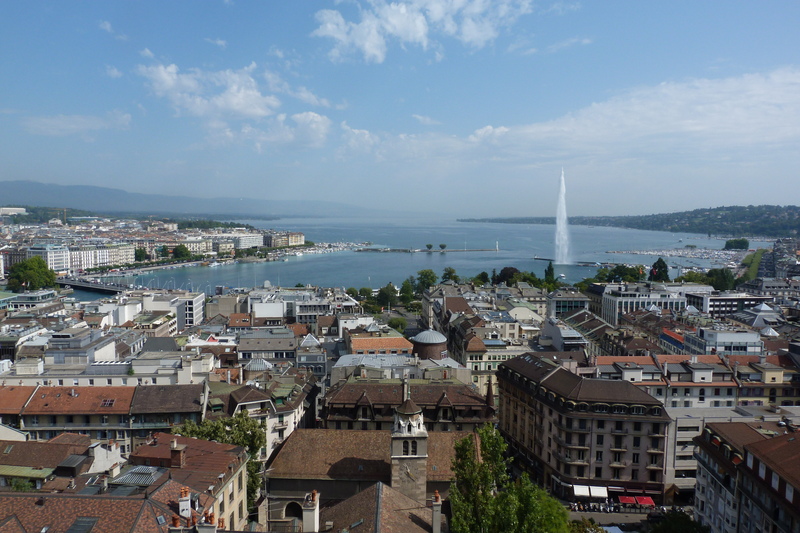 We arrive to find Geneva beautiful, clean and safe. We dump our packs at the hostel and head immediately to the harbor to enjoy a local beer and glass of Rosé. 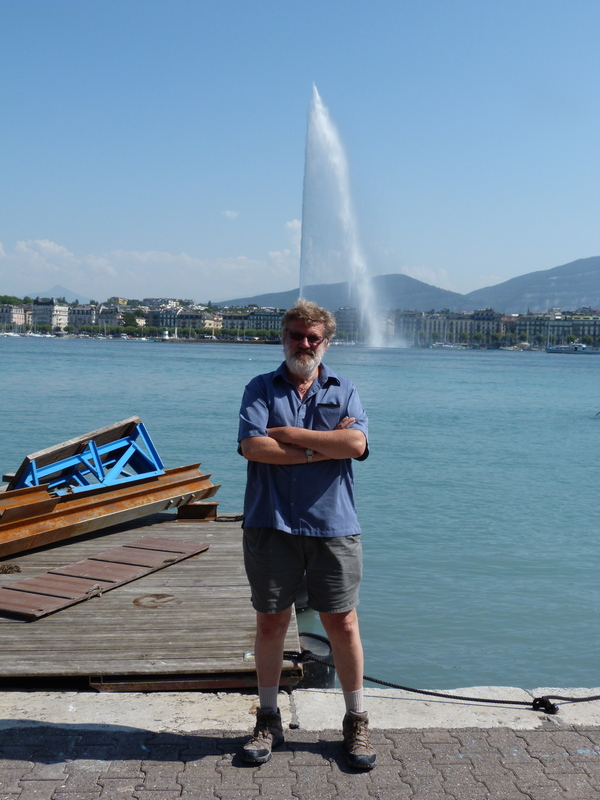 The focal point of the harbor is a fountain that jets water 200 meters into the air. It’s blazingly hot, so we walk out on the jetty just to feel the spray. 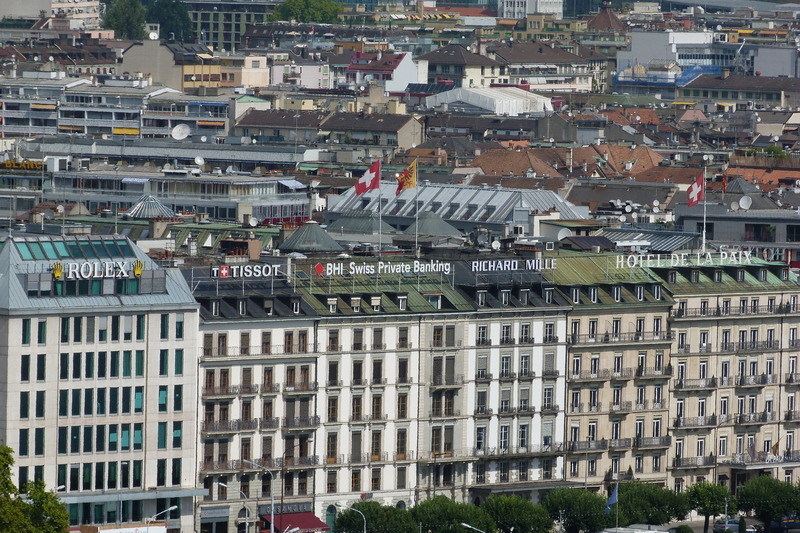 There are beautiful apartment buildings surrounding the harbor, all with huge signs advertising the most expensive brand names: Rolex, Cartier, Cardin. The love of money seems to ooze from the stores – I see a stack of gold attaché cases that is the perfect representation for the conspicuous wealth that surrounds us. But the architecture is beautiful and the old city is a dramatic warren of angles and irregular roof lines. Roof lines in the old village. Note the jet spray in the background. However, it is clearly not a place for mere mortals to shop. When we try to find a place for dinner, we are floored by the prices – 26 Euros for a piece of lasagna (about $32 CAD). Not that we want lasagna, but it sticks in my mind as one of the least expensive dishes on the menu. After great argument, we resort to a place recommended by the hostel, clearly for the student tourist crowd. It specializes in chicken dishes. We have walked too much, are too tired, and without thinking order half roast chickens with “country” fried potatoes and “special sauce”. Sound familiar? We realize we have just ordered Swiss Chalet in Switzerland. 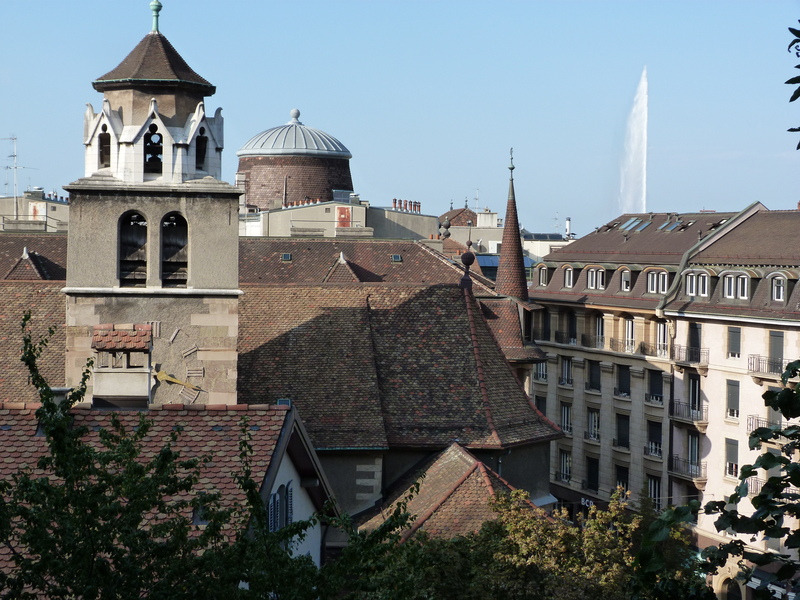 St. Peter’s Cathedral, (http://www.sacred-destinations.com/switzerland/geneva-cathedral) best known for being where John Calvin preached, offers a stunning view of the city, and also a unique perspective on the history of the area. 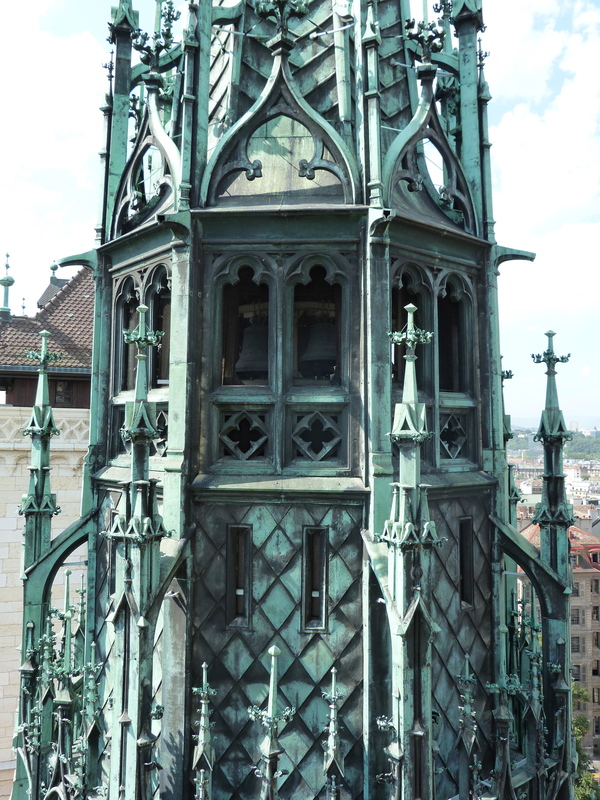 We climb the steep stairs to the top of the north tower as the bells chime alongside us. A working archeological site under the cathedral (http://www.site-archeologique.ch/contenu.php?id-node=2) takes us through 2000 years of worship and habitation, beginning with the burial mound of a Allobrogian chieftain in 40 BC. The site has uncovered his remains, but left them in situ. He is observed, but undisturbed. Roman, Celtic, Christian constructions are all exposed under the cathedral. It is the highlight of our brief stay, and helps us to better ground ourselves after the unsettling, ostentatious, contemporary city.